On April 23, 2013, Antwone Fisher gave testimony to the U.S. Senate Committee about the trauma suffered by children placed in the foster care system. His story was adapted for the silver screen and told in the 2002 film ‘Antwone Fisher’ starring Denzel Washington and Derek Luke. Washington also directed the biopic. The film is based on of Fisher’s autobiography which became a New York Times bestseller upon its release. This is history and frankly one of the best autobiographies I have ever read. His story about a young child entering the foster care system and placed in a family composed of biological and foster children is critical to understanding the fears and concerns that consume young boys and girls as they struggle to fit in with a family the have never before met. The household he enters is beyond dysfunctional and created an environment that would prevent most children from having what would be considered a normal life. As he grows up, he find ways to survive his existence at home while learning more lessons about life on the streets. His experiences on the street are frightening but the harsh reality of the chances a person will take in an effort to escape a detrimental domestic environment. At time during the book it does seem as if all hope is lost for Fisher and that all the odds are completely against him. Along with his foster brother Dwight, the two of them learn to navigate the system of anarchy encouraged by the Picketts, their foster family and their biological children. Towards the end of the book as he approaches adulthood, his life takes on new meaning with his admission into the United States Navy where he finds himself and begins his journey to manhood. A chance experience in Japan and a commander who becomes the father he never had change his life. And as the book closes, we are uplifted as he completes his journey and embraces having a family of his own and putting the past behind him. He never forgets his beginning and his actions towards his former foster family are understandable and respectable. The book pulls the reader in from the start and refuses to let go and by the end of it, you too will be rooting for Fish to succeed. His experiences as a child in foster care highlight the existence that thousands of children today must go through here in the United States. And at times when they feel as if all hope is lost they can turn to Fisher’s story for inspiration and hope. This is his life and the incredible journey he undertook as he was finding fish. Blogger, IT Admin, Nyctophile, Explorer and Brooklynite in the city that never sleeps. 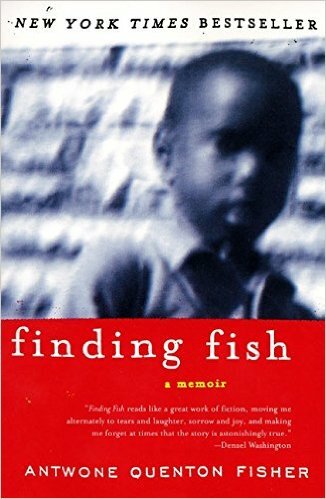 Posted on August 26, 2015, in Biographies and tagged Antwone Fisher. Bookmark the permalink. Leave a comment. My thouغghts around Koraan(moslem's holy book).. Does God Exist? Is belief in God reasonable? a girl who tries to find herself through philosophy.